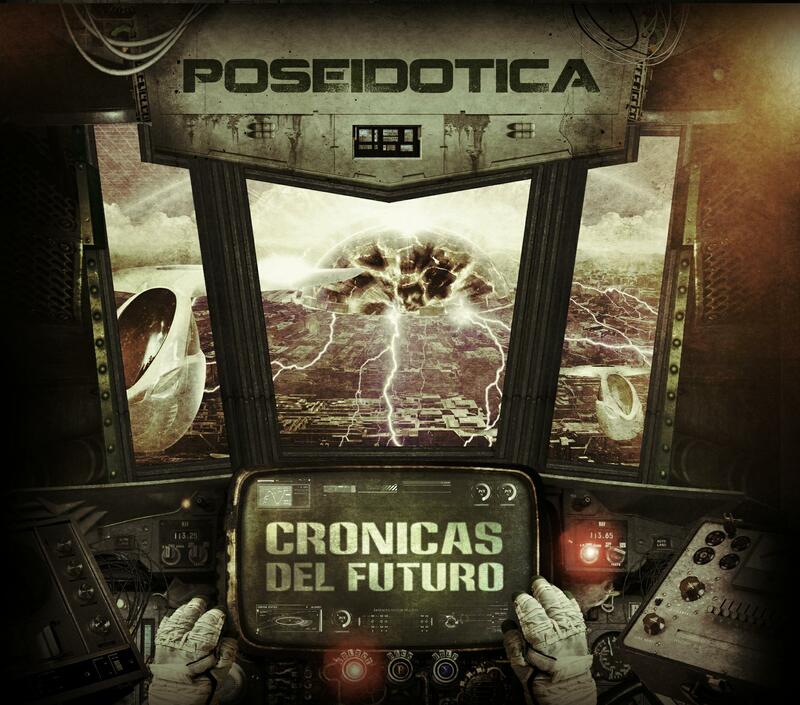 In 2008, Argentinian progressive metal/fusion band Poseidotica delivered their second album, La Distancia (reviewed for Aural Innovations #40), which proved to be one of the most musically thrilling releases of that year. Epic album closer Las Magnitudes in particular featured passages of such beauty and power that would melt the heart of even the most jaded listener Now they are back with Cronicas Del Futuro, released on the tenth anniversary of the band’s formation in Buenos Aires. The big question is, can it live up to the awesome legacy of their previous album? The first thing that hits you about Cronicas Del Futuro is the fantastic gatefold and die-cut packaging, worthy of such classic 1970’s album covers as In Search Of Space or Tales from Topographic Oceans. Designed as the dashboard and windscreen of some alien space vehicle, the cover features a number of interchangable cards that enable the listener to set the controls for a number of terrifying destinations, with the journey starting before the first note on the CD is even played. Anyone tossing up whether to buy Cronicas as a CD or download would do well to go for the actual disc, as the cover alone is worth the financial outlay. Perhaps that is just as well, given that the musical content clocks in at under 30 minutes, rather stingy in an age when discs can accomodate 80 minutes of music. There are no 15 minute epics this time around, with opening track Elevacion being the only one that exceeds five minutes. Surprisingly for a twin guitar band, the album opens with an eastern vaguely Tangerine Dream-esque synth pattern (courtesy of guest keyboardist Ernesto Romeo) that quickly gives way to classic rock guitar and bass riffing. The playing is highly melodic and uniformly excellent across the entire album, without once resorting to undesired and egotistical displays of guitar heroics. La Resistencia and Los Extranos give the band opportunity to rock out like an instrumental fusion of Rush and Dream Theater, while the breakdown in Dimension Vulcano and the fragile acoustic picking of Confines Del Caos show that the musicians know when to leave spaces in the void. Otra Fuga Incierta has some classy and intricate bass playing, while the self-explanatory Cyberpunk crams GBH intensity into its 71 seconds. The two minute Alunizar provides a suitable comedown experience to close the album. Perhaps the best musicial touchstone for Poseidotica is Rush’s 1978 classic La Villa Strangiato, although unlike the subtitle of that track, Cronicas Del Futuro is anything but an exercise in self-indulgence. The absence of an epic grand finale means that the heights of La Distancia have not quite been scaled this time around, but Cronicas Del Futuro remains an essential progressive metal purchase for 2012.